I preface this review by stating (somewhat sheepishly) that this is my first horror novel. Honestly? I've always secretly longed to read a Stephen King book, but I never knew where to jump in. So I contented myself with reading On Writing and his book reviews, admiring the talent from afar, so to speak. Then the other day DHannounced the need for the King moratorium to end once and for all. After a brief but intense conference with a fellow connoisseur, he pronounced himself convinced that It was, without a doubt, the one for me. I took him at his word. We are soon introduced to a boy named Bill who stutters and his cute little brother Georgie who, even I can tell, doesn't have a snowball's chance in hell of making it out of this chapter alive. A few pages later I feel certain I should never have opened this book. There's a freaking clown in the storm drain and I find myself truly creeped out and begging Georgie not to go near the storm drain. Just let the paper boat go and walk away, Georgie! I won't go into the plot too deeply except to say that the story alternates between a series of seminal events in 1958 and again in 1985. The first half depicts the cosmic coming together of seven eleven-year-old kids. Six boys and one girl, self-proclaimed Losers all of them. A stutterer, a wisecracker, a hypochondriac, a fatboy, a birder, a black kid, and a tough girl. These seven form a united front against a trio of unusually vicious bullies. But slowly, and with an almost spine tingling sense of inevitability, they realize they've been brought together for a larger purpose than warding off Henry Bowers and his cronies. Soon they're all in and there's no turning back. Not that any one of them would be able to turn their backs on Stuttering Bill anyway. He is the real heart of the story. The one who never backs down. The one the others would gladly walk through fire for. This section of Kansas Street was known as Up-Mile Hill. Bill took it at full speed, bent over Silver's handlebars to cut down the wind resistance, one hand poised over the cracked rubber bulb of his oogah-horn to warn the unwary, his red hair blowing back from his head in a rippling wave. The click of the playing cards had mounted to a steady roar. The effortful sneer had become a big goofball grin. The residences on the right had given way to business buildings (warehouses and meat-packing plants, most of them) which blurred by in a scary but satisfying rush. To his left the Canal was a wink of fire in the corner of his eye. "HI-YO SILVER, AWAYYYY!" he screamed triumphantly. Silver flew over the first curbing, and as they almost always did at that point, his feet lost contact with the pedals. He was freewheeling, now wholly in the lap of whatever god has been appointed the job of protecting small boys. He swerved into the street, doing maybe fifteen miles an hour over the posted speed of twenty-five. It was all behind him now: his stutter, his dad's blank hurt eyes as he puttered around his garage workshop, the terrible sight of the dust on the closed piano cover upstairs--dusty because his mother didn't play anymore. The last time had been at George's funeral, three Methodist hymns. George going out into the rain, wearing his yellow slicker, carrying the newspaper boat with its glaze of parrafin; Mr. Gardener coming up the street twenty minutes later with his body wrapped in a bloodstained quilt; his mother's agonized shriek. All behind him. He was the Lone Ranger, he was John Wayne, he was Bo Diddley, he was anybody he wanted to be and nobody who cried and got scared and wanted his muh-muh-mother. Silver flew and Stuttering Bill Denbrough flew with him; their gantry-like shadow fled behind them. They raced down Up-Mile Hill together; the playing cards roared. Bill's feet found the pedals again and he began to pump, wanting to go even faster, wanting to reach some hypothetical speed--not of sound but of memory--and crash through the pain barrier. He raced on, bent over his handlebars; he raced to beat the devil. If that scene doesn't get you in your gut, you might be dead inside. I can't believe I waited this long to read it. I stayed up nights reading, glancing over my shoulder every few seconds, looking for something orange and silver creeping up behind me, scared to the tips of my toes but unable to put it down. You were absolutely right, babe. It was the one for me. I haven't read this one yet, but I'm sold. I will be putting it on hold at the library as soon as I finish typing this comment. 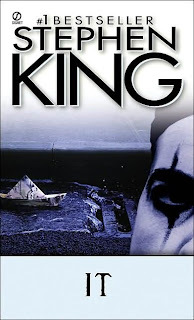 It's been a while since I've read any Stephen King, but I did enjoy what I read. Creepy, but good. You should look for his novella, The Body, which is what the movie Stand By Me was based on. I remember that one being particularly good, and less full of horror. The first time I read this, I was ten. At one point, I had to put it down for a month because I was so scared (my mom warned me; I sneaked it into my room anyway). I still love it, and re-read it every other year or so. For me, it's all about the summer of '58. I enjoy the story when they're older, I like all of them -- but I *love* those kids. I love the Morlock holes, the chocolate milk that hides the blood stains, the slingshot, and every creepy, horrifying part of it. And now I'll probably be pulling it out again soon :-D It's definitely the right time of year. I've never read a horror novel either. Because I would never, ever want one in my house while I was asleep. So, you are much braver than I! I've only seen the movie (about a half dozen times), but I have never read the book. Now I want to. That sounds like an amazing story--but I know that I can't handle horror. I've tried it before, and it sends me into an absolute, indescribable panic. I've read a couple of King's short stories--they were less "horror" and more "creepy", but they still got me to the point where it took me 3-4 hours to fall asleep every night because I was lying there, completely frozen in fear. I'm the epitome of scaredy-cat, which is too bad, because this one does sound good. I think you'll really like it, Allie. I seriously can't get it out of my head. In a good way. Meljean, I don't know if I'd have made it at ten. Well done you! I agree, the characterization of the kids is out of this world. This may become a regular Halloween read for me. Martha, I can just see you now. Unable to go to sleep until you finally grab the book off the shelf and chuck it out the window! Brie, I definitely recommend it. Now I want to see the movie. If just to see if they get the kids right. Emily, there were several late nights when I was up with the baby and wanted to pick it up but didn't because I knew it would get to me in my sleep-deprived state. I love King, but for some reason, I can't handle his full length novel, even IT, which my husband ADORES. I love his short stories though. They are just as creepy, but for smaller bits. Sounds like I need to read "The Body." Diana, it was really interesting listening to my husband and his buddy talk about reading IT for the first time. I think they felt like he just really captured what it's like to be an adolescent boy and to feel like an outsider. Angie I am so glad that you loved IT--this is one of my top 5 favorite books of all time! I too read IT at a young age (I watched the tv movie when I was 12, had the bejeezus scared out of me, but then immediately rode my bike--yes, screaming "Hiyo Silver AWAAAAAAAAAY!!!!!" in mind--to the library and checked out the book...which I stole and never looked back *ninja*). And hey if you're into King now, I highly recommend reading The Talisman (with Peter Straub), which also follows a young adolescent boy on a horror/fantasy quest. Or, my all time favorite books, The Dark Tower series. Lol. That comment made my day, Thea. I kind of thought you might be a King fan. ;) I hear very good things about the entire Dark Tower series. Can't wait to hear what Ana thinks of IT!